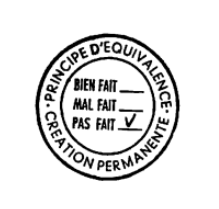 L’ouvrage complet est légèrement indigeste, je me suis permis de n’extraire en pdf que le chapitre III intitulé “The artistique proposition”. Il réunit des entretiens avec John Cage (cité d’ailleurs dans le texte de Didier Semin précédemment posté), Allan Kaprow, Benjamin Patterson, Dieter Rot, Joseph Beuys, ainsi que des contributions de George Brecht et Dorothy Iannone. La lettre de cette dernière est particulièrement belle et si vous ne pouvez lire qu’une page ce devrait être celle là. “Do-it-yourself. Collect pictures (photographs) of well-known critics. Have them blown-up to life size. Stick on the right bottom corner of each one the little red dot galleries used to indicate “vendu” “sold out”. “When she was 5, my daughter Marcelle refused to draw in school, because her teacher said her drawings were bad. As if the drawings of a child could be bad (or good). Combining the child’s spontaneity with the teacher’s authority creates a problem where there is none (at home, Marcelle draws and paints constantly). What I had in mind was a kind of pioneer world that should be in the hands of artists, where we will create, and by creating, make claims upon this part of the world. I call this the idea of permanenet creation. There would be no difference between students and teachers. It might be just as a kind of availability or responsability that the artist is willing to take, but anybody might make suggestions about what kind of things might be investigated ot looked at and I think it might be in a spirit of fun at times, but many problems may be solved by the way. One principle I have developped is to get rid of the idea of admiration, which is implied in our whole society – the idea of authority and admiration and receiving prizes is implied. You might be, or I might be with fifty young people – if we engage in the type of dialogue that you have in mind, the whole group might come out with, by brushing information against information, all kinds of answers. (…) Search – I search for happiness and joy – becomes research. We’ve been talking about the art of living – we’ve been talking for centuries. We have to turn the world to artists, always. Yes, but without giving them the wrong kind of power and responsibility. I think that Plato was worried about artists taking over the world, because he assumed that they would take over in the way that the politicians normally do, whereas nobody ever asked the artists to take over in the way artists usually do – that is, to provide play and nothing else. So, we can see in Plato, or as Engels put it, a notion of the world as “upside down” …..